The Quaternary era commenced about 2.5Ma ago and completes the geological history of Northern Ireland. It’s deposits, which cover most of the older rocks, are unconsolidated, relatively soft and contribute directly to modern soils. They are shown on the detailed maps of the Geological Survey of Northern Ireland and have special significance for engineering, agriculture and the environment. The final glacial episode had an important influence on the landscape of today and the variable climate through the era probably has implications for future climate change. 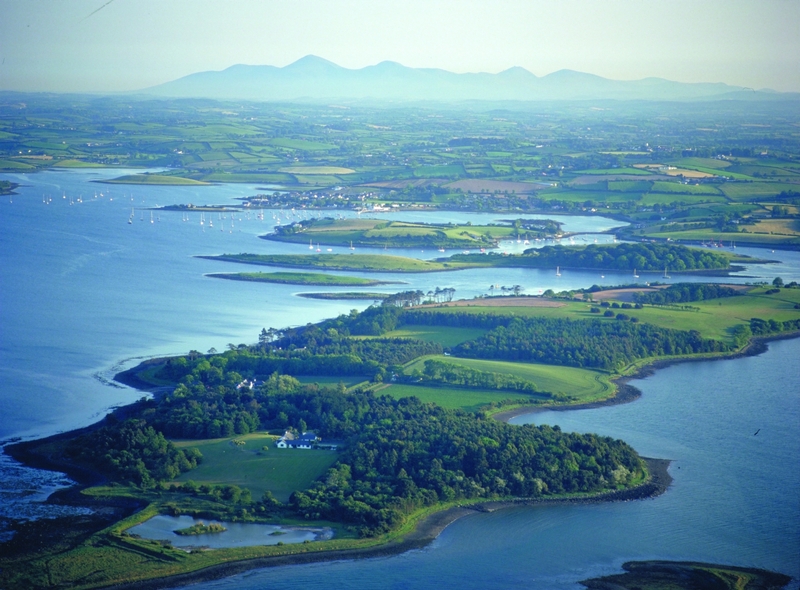 Northern Ireland has a wide range of spectacular glacial features of late Pleistocene age and Irish words, such as drumlin and esker are now used internationally in glacial geology. It has been written, "….the drumlins of North-East Ireland belong to .... the most remarkable drumlin assemblage in the world"  and the famous ‘basket-of-eggs’ topography of Co. Down makes a strong case for the claim (P948043). Spectacular eskers are found at Causeway End [J 245 646] near Lisburn, Muntober [H 740 810] northwest of Cookstown, Eskermore [H 525 678] near Beragh and north of Bellaghy [H 970 989]. 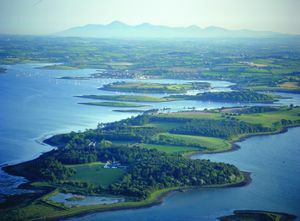 Ice-smoothed and striated surfaces, kettle-holes, ice-wedge casts, deeply cut channels, moraines and many other glacial and deglacial features can be seen in Northern Ireland. All help interpret what happened in our most immediate past. The remains of plants and animals in Quaternary deposits indicate the climatic conditions of their time by reference to the habitat occupied by the same or similar species today. Plants (especially pollen), insect remains, mammal bones and marine organisms like foraminifera are important climatic indicators. Age estimates, of varying reliability because of contamination problems, may be determined for Quaternary deposits that contain wood, shells or bones. Several methods of dating include radiocarbon (reliable to about 30 000BP) and amino acid (reliable to around 200 000BP*) (* BP means Years Before Present). A continuous record of seasonal climatic change combined with accurate dating of sediments containing tree remains has been established from tree-ring growth patterns (dendrochronology) and covers the past 7300 years . Most important is the establishment of reliable correlation between sites and the development of a stratigraphy. The following account catalogues events from the earliest to the latest but the reader should note that understanding of the epoch in Ireland is still developing and parts remain controversial. Particularly, the story of changing sea levels has yet to be satisfactorily understood and linked to the climatic events. 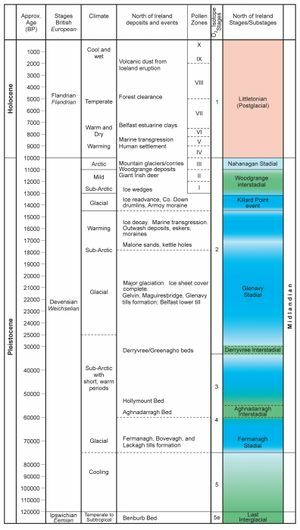 The Quaternary is divided into the Pleistocene and Holocene, the latter covering the last 10 000 years. Most local names used in the following text are shown on Figure 18.2. ↑ Coxon, P. 1997. Pleistocene climate change: the evidence from Irish sequences. In: Sweeney, J. (ed.). Global change and the Irish environment. Royal Irish Academy, Dublin, 17–35. ↑ McCabe, A M, and Clarke, P U. 1998. Ice sheet variability around the North Atlantic Ocean during the last deglaciation. Nature, London, 392, 373–77. ↑ Charlesworth, J K. 1939. Some observations on the glaciation of north-east Ireland. Proceedings of the Royal Irish Academy, 45B, 11, 255–95. ↑ Baillie, M G L. 1993. Palaeoecological Research. The Biochemist. The Bulletin of the Biochemical Society, 15 (4), 23–26. This page was last modified on 25 September 2017, at 13:58.